Thank you to San Diego Home & Garden for featuring the new Miraflores Collection by Paul Schatz for New Ravenna Mosaics. Connect with San Diego Home & Garden by clicking here or follow @SDHomeGarden on Twitter. Jaen, a natural stone waterjet mosaic shown in Verde Luna, Rosa Verona and Giallo Reale polished, is part of the Miraflores Collection by Paul Schatz for New Ravenna Mosaics. 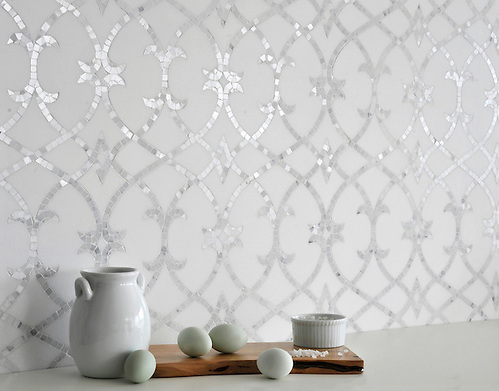 Avila, a natural stone waterjet and hand cut mosaic shown in Thassos honed and Statuarietto polished, is part of the Miraflores Collection by Paul Schatz for New Ravenna Mosaics. 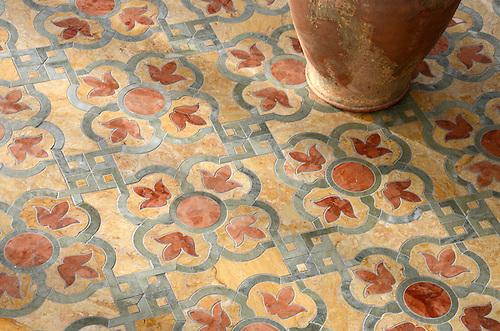 To see more of the Miraflores Collection, click here. To learn more about Paul Schatz, click here.